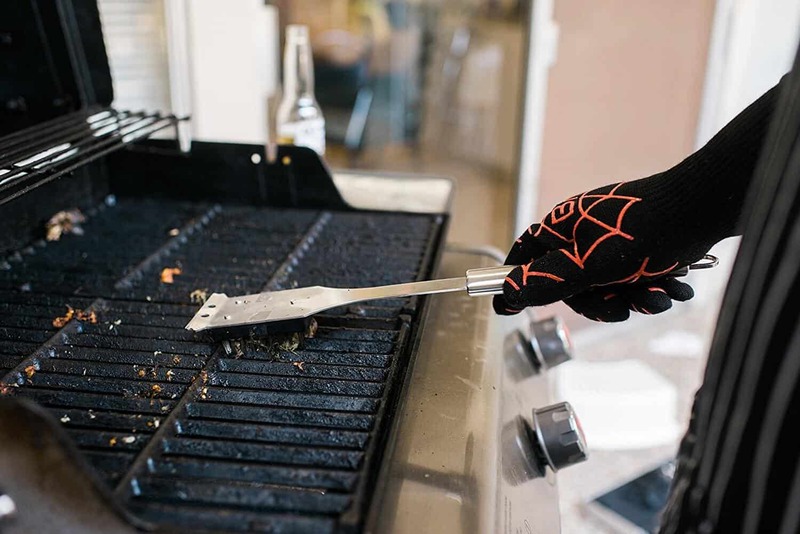 The Bruella Heat Resistant Grilling Gloves are a must-have item for any griller or home cook. Although they’re advertised as grill gloves, they work inside the kitchen just as efficiently as they work out on the patio. The gloves routinely top the list in rankings that detail the best grilling accessories. 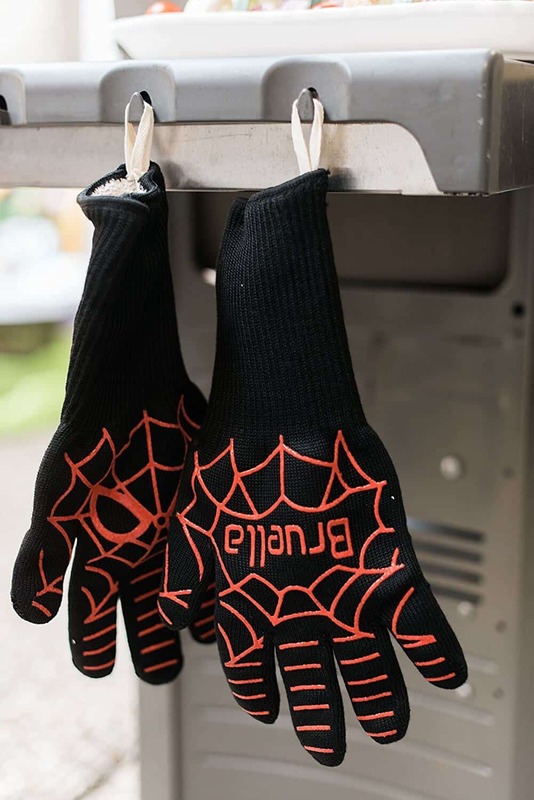 Unlike other gloves on the market, the eye-catching design on the outside puts one in mind of Spider-Man. You might not be swinging from skyscraper to skyscraper or saving Mary Jane while you wear them, but they’ll make you the biggest superhero in the backyard. The unique fabric holds a hidden surprise and makes the gloves breathable. They offer profound ease of motion so that you won’t be encumbered by a bulky mitt or a faulty fit. The black and red gloves feature red webbing with the brand name on the one hand and an unmistakable Spidey-like face on the other. 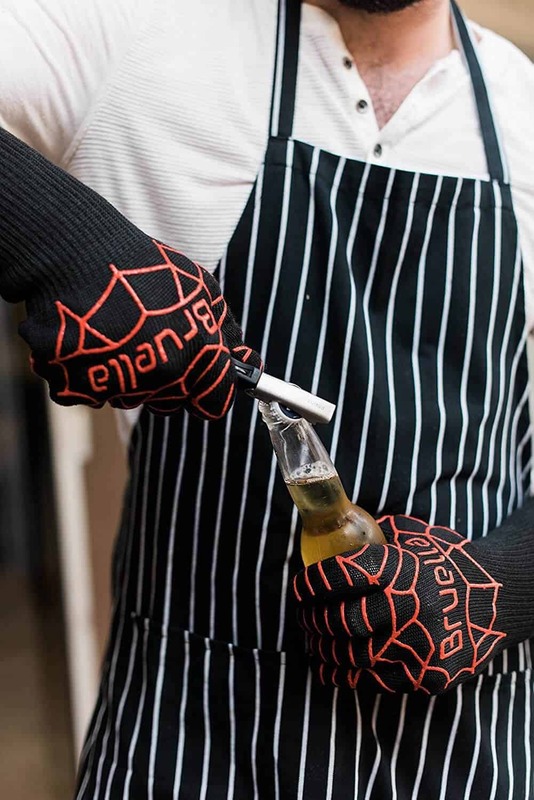 If you aren’t careful, you might get them mixed up with your regular winter gloves just because they look more badass than a grilling accessory has any business being. You can’t beat the fit, nor can you put a price on your peace of mind in knowing you won’t accidentally burn yourself. Every home cook needs a pair of grilling gloves. It doesn’t matter if you do your best work on the stove or the grill. Find something that will protect your hands without impeding your ability to cook like a superstar. Bruella’s grill gloves stand apart from other brands for a number of reasons, beginning with quality at a price that’s affordable to the average Joe. You generally have to pay a small fortune to own insulated gloves made with Kevlar-grade material. It usually costs a hefty sum to feel that safe while you grill. Recognizing that not everyone has the means or even the desire to pay for expensive, top-of-the-line grilling accessories. Bruella set out to make sure that no cooks felt the need to sacrifice confidence in the quest to find a pair of gloves. Since the brand’s founding in 1985, the aim has always been the same: craft gloves that can handle the highest temperatures without burning or scorching the wearer, and offer them at a price that most, if not all, can afford. The brand brings a certain whimsy to its merchandise. That’s obvious—and visible—in the design of Bruella’s gloves. However, as appealing as the aesthetic is, the design and construction are even more critical. Spidey and his web look cool, but the stand-out detail is the length of the gloves. The cuffs climb up the forearms, which goes a long way toward proving how much research and trial-and-error Bruella put into designing them. Have you ever reached into the oven or onto the grill while wearing an oven mitt or a shorter glove, only to have your wrist burned by the side of a hot grating or rack? The shock of it is sometimes enough to make your arm jerk back, which is an excellent way to ruin a lasagna or a platter of steaks. The cuffs, made of the same heat-proof material, erase that risk. The fit is similar to traditional gloves, in that they hug the fingers and the palm rather than bunching up at the fingertips or sliding off your hands. That ease of movement is essential in cooking. You can’t flip burgers or take a lid off a pot if you’re unsure of your grip. From the moment you slip on the gloves, the entire goal is to keep you cooking safely and efficiently, so you don’t waste time worrying about—or committing—haphazard accidents. All gloves work in much the same way, and the Bruella Heat Resistant Grilling Gloves aren’t any different. Unlike with, say, winter gloves, however, you have to be sure of the sizing and fit. That’s another area where Bruella stands out among other brands on the market. They know that one size does not fit all, particularly when you’re dealing with items used around extreme temperatures, and yet they managed to craft a glove that clings to large and small adult-sized hands without giving up an ounce of flexibility. To use them, just pull on the insulated grill gloves. At about 14 inches in length, you should find that the extended sleeves cover the majority of your forearm. Bruella guarantees that their gloves are around 2.3 inches longer on average than any of their competitors’, so you get ample length without bagging or extra material. The Bruella Heat Resistant Grilling Gloves can easily be used for indoor cooking and outdoor grilling or smoking. Let them do double-duty as oven mitts or reserve a pair exclusively for your barbecue pit. Its high-quality features and affordable price will quickly make it one of your favorite accessories. The material used to make Bruella’s grilling gloves is one of its most spotlighted features. The fabric is a 3-layer para-aramid Synthetic Kevlar. Even more impressive, it’s military grade. The same material is often used in the construction of the bodysuits worn by firefighters and in body army for the military. In addition to keeping you safe from the heat, the Kevlar-quality gloves also protect your hands from cuts and scrapes. All heat-proof gloves are resistant to heat; that’s their claim to fame. The Bruella Heat Resistant Grilling Gloves are thoroughly tested against the most intense grilling heat. You’re safe cooking in temperatures as high as 932 degrees Fahrenheit/500 degrees Celsius. Because the sleeve cuffs are over two inches longer than other gloves, the same material shields your wrists and forearms from extreme heat, as well. The fit of Bruella’s insulated gloves is magical. Gloves rarely fit correctly even if the tag claims that one-size-fits-all. Due to the construction of the material and the extra length, these gloves fit snugly regardless of the size of your hands. An adult with small hands or short fingers will have just as much luck as someone with large palms and thick or long fingers. You don’t have to continually tug at the cuffs to make the gloves fit properly. You can thank Bruella’s manufacturing process for that. Bruella went all out on these gloves while making sure they paid attention to even the smallest of details of convenience that most people wouldn’t even consider until it was too late. By adding cotton loops woven into the cuffs, Bruella understood the benefit of being able to hang your gloves out of the way when not in use. The loops also provide an easier way to pull the gloves on and off. While the dark colors of the gloves will hide most stains, Bruella realized the need for their gloves to be cleaned from time to time. A machine wash on cold is perfectly fine for these gloves and will not harm them in any way. They do recommend you hang dry them though. While not “Cut Proof” (a BIG distinction), these gloves offer slight cut resistance with a rating of level 3. This means you are safe from scrapes and brushes with sharp objects, but I wouldn’t count on or attempt anything more than that. So don’t try stabbing your hands with knives while showing off your new gloves; they are mainly for protection against the heat. With a heat resistance of up to 932°F (500°C), these gloves can be used for more than just cooking and grilling. They’re also perfect for campfires, fireplaces, hot kilns or anything else that brings the heat. Just remember, these gloves are not waterproof so hot liquid will still be hot. 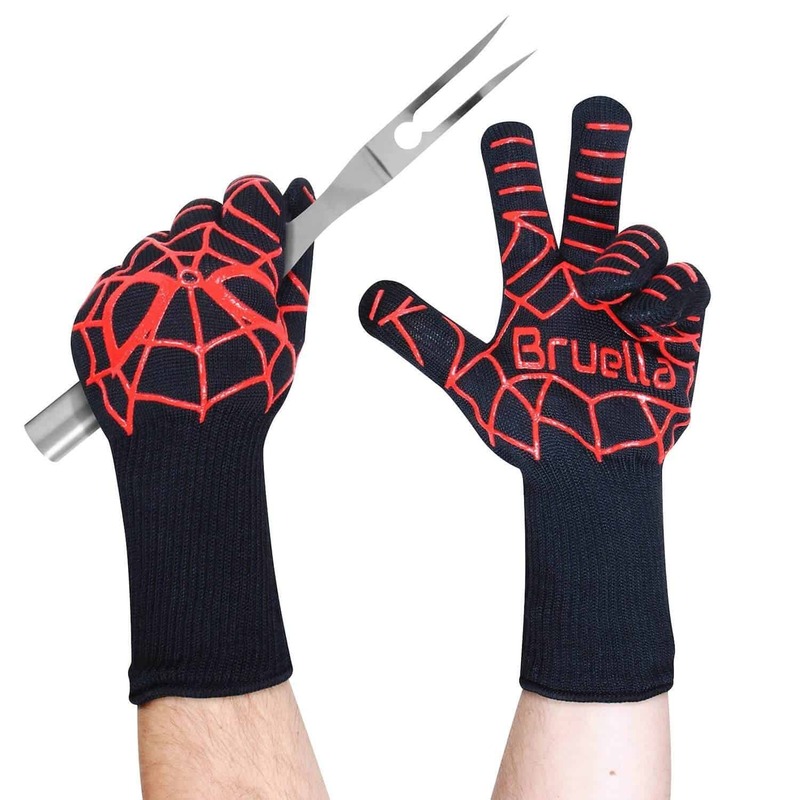 Who Is The Bruella Heat Resistant Grill Gloves For? Home cooks, professional chefs, smokers, and grill masters are the ideal client base for Bruella’s Kevlar gloves. Anyone who’s tired of the way silicone gloves never seem to fit will benefit from these close-fitting alternatives, too. If you frequently cook at high temperatures, then you also need the protection offered by their longer length and snug grip. Cooks who are tired of trying to use cooking implements or lift lids while wearing thick, bulky oven mitts or grill gloves ought to try them, as well. 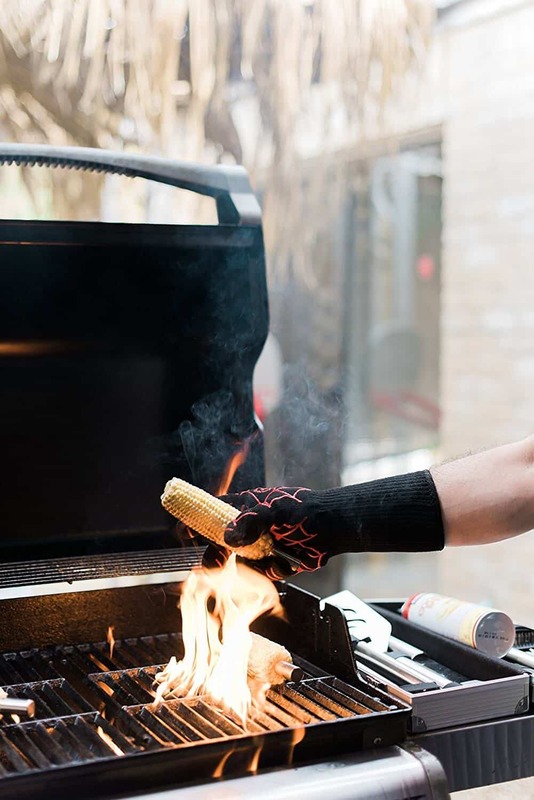 Insulated grill gloves are perfect for anyone who enjoys the culinary world. They’re a necessity for people who frequently grill, especially those who don’t care whether it’s summer or winter. It’s probably not worth the expense if you only fire up the grill a few times each season. If you prefer a glove that doesn’t offer such a snug fit, these might not be for you either. Folks who aren’t fans of cooking can give them a pass, too. The heat protection and the snug tailored fit of these Bruella grilling gloves are both big pros for the product. The extra-long sleeve for added forearm protection and overall build are all fantastic perks that are hard to find in other cloth grilling gloves at this price. The biggest con may be that for some people who prefer a loser-fitting glove, the snug fit might be uncomfortable. It’s also important to remember that these gloves are not waterproof so if you are intending to use them where they may get wet, this may be a con for you as well. Through most retailers, such as Amazon, the Bruella Heat Resistant Grilling Gloves are less than $21. You’ll usually spend around $19.99, although you can also get deals for services like Prime. It gets even better though. Each pair of gloves comes with a lifetime warranty, although customer reviews suggest you won’t ever have to use it. 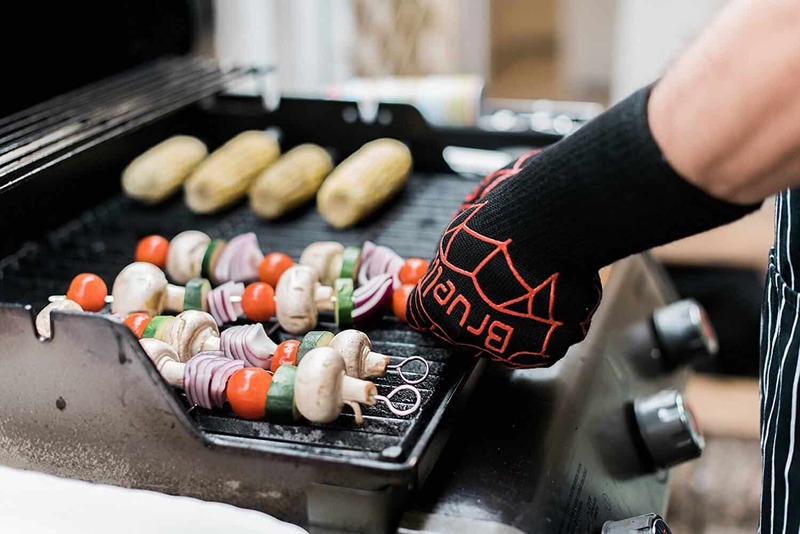 Whether you need something for the grill or a versatile pair of oven mitts, it’s worthwhile to take a look at the Bruella Heat Resistant Grill Gloves. The flexibility alone makes them a valuable pick. You can’t live without them if you spend any amount of time working your magic at the stove or presiding over the grill. You can’t beat the protection of the Synthetic Kevlar or the convenience and peace of mind from injuries these gloves provide. Simply said, Bruella heat-resistant grilling gloves are form-fitting and flexible, versatile and exceptionally well made. When you factor in the lifetime, no questions asked warranty and the super low price, these grilling gloves really stand out from the crowd in my opinion. I hope this Bruella heat-resistant grilling gloves review was helpful for you. As always, if you or someone you know is interested in heat resistant cooking gloves please consider sharing with your friends or on social media. Sharing is caring my friends! If you would like to leave a comment or have a review of your own to share on the Bruella grill gloves, please do so below. We always welcome your input.